Halloween was a long, fun-filled day this year! 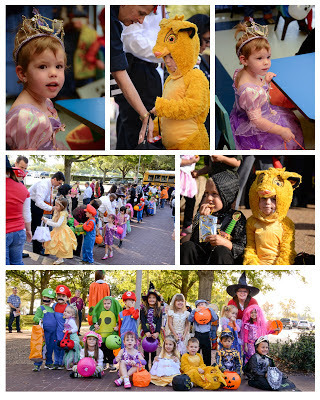 It started with trick-or-treating for the younger kids at the day care in the morning. Jackson and the older classes passed out candy to Audrey and the younger kiddos, which was really cute. 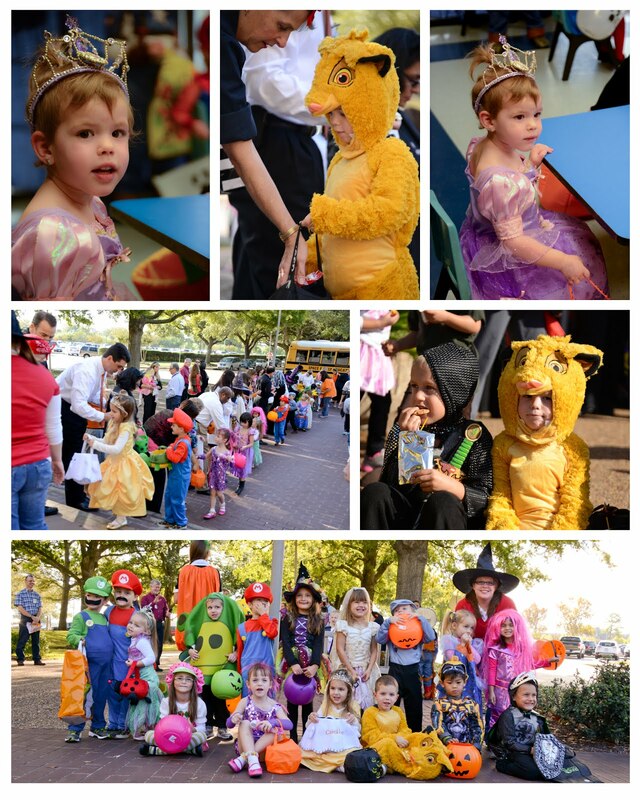 Then the older kids piled into the bus and did a little trick-or-treating around the JSC campus. Lots of co-workers and friends greeted the kids with smiles and candy! Audrey chose to be a princess this year. Specifically, she chose to be Rapunzel, and because of her short hair, we deemed she was Rapunzel after her hair is cut off in the movie Tangled. She loved it! Her teachers asked if she could wear the costume everyday because she was more calm and controlled...like a little princess. Jackson chose to be Simba from the Lion King. When asked what Simba says, his most common replies were either the typical roar or a song from the movie, which is his current favorite. He has a knack for remembering songs, so he could sing most of several of the songs! 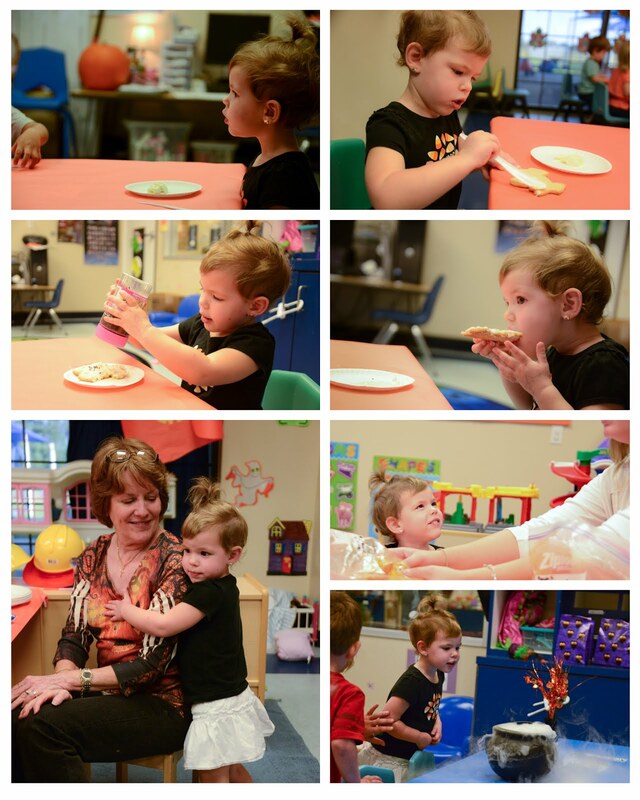 Audrey's class spent afternoon partying! Ross' mom spent the week with us, so she was there to enjoy the festivities. The teachers did a great job making this first class party a success. Audrey and her friends got to decorate their own sugar cookies (yes, I made them), play with "yucky stuff" (the insides of a pumpkin), and see a witch's brew (made from dried ice). I'm very sad to say I lost the pictures from trick-or-treating at our house that evening. (Make sure you've gotten ALL of the pictures off before reformating your memory card...lesson learned I hope!) The kids had a ton of fun though. We made it around our small block and down the street before calling it quits. Audrey was a little scared of some of the scarier costumes, but both did great knocking on doors and saying trick-or-treat and thank you. I think the highlight of their evening was handing out some candy before going to bed. They loved being the one to give to others! It was definitely a long, fun day! There are more pictures in the album from the fun at school.